Created 5/24/1999, links updated monthly with the help of LinkAlarm. Occasionally an interpreter is confronted with a text that includes words from a foreign language, be it a scholarly quote in Latin or Greek or a clever saying in Spanish or French. At this point we usually trust the speaker to translate it into English momentarily, and while we're waiting we merely sign NOW SPEAK FOREIGN LANGUAGE, or if we recognize the language we would say which one it was. What happens when the point of the discourse is to learn the foreign language itself? I hope to make some suggestions that would be helpful to an ASL interpreter for such a setting, using my experience interpreting for German courses. It is now seen as politically correct to say "second language", rather than "foreign language". I think this is confusing since this will be the deaf person's third language if they use Sign and know English. I shall use the term "foreign language" throughout this paper. The task is difficult enough without having a previous knowledge of the language being taught. Interpreters for foreign language classes really should have had at least two years of instruction in the foreign language they will interpret, even for an introductory course in that language. It may have been years since they used the foreign language they learned in high school, but with some preparation before each class it will come back to them. If they start by interpreting the first introductory course, they will relearn it with ease. As a last resort, interpreters with no knowledge of the language can start by interpreting German 1 and working their way up. Increasing numbers of interpreters have a third language, besides ASL and English, and I believe that a third language, whether it's a spoken language or a signed language, is very helpful for further breaking away from the unavoidable ethnocentrism that monolinguals may have. Having the textbook for the class is essential. By following the syllabus and reading ahead, the interpreter can know which aspects of the language and which vocabulary items will be dealt with in class on any given day. Remember to bring the book to class because it will help you let the deaf students know where you are. The teacher may ask a question from the book without mentioning the number of the question, and by checking your copy of the book you can tell them where to read, instead of laboriously fingerspelling the question when they could get it faster by reading it in the text. If the students are reading an extended passage from the book, you might as well tell the deaf students where the class is in the textbook and have them read along. It may be difficult for you to understand some hearing students when they read German or speak it. We know that it takes more effort to interpret a speaker with a heavy accent or a foreign Deaf person who may have remnants of his/her foreign sign language mixed into their ASL. All the more so when we hear mispronounced German, which is at best a second language for most of us. Having the book turned to the right page may help you use cloze to figure out which German words they are trying to pronounce. Doing the homework is also very helpful, especially if the language is new to the interpreter or has been unused for several years. If the interpreter does not wish to purchase the textbook and cannot get a copy from the teacher or library, it is possible to order a desk copy1 by writing to the publisher. If that doesn't work, xerox the pages you need, use an old German text, or borrow the teacher's text at a regular time when you are free and the teacher is busy with other things. Consider tutoring or working together with the student if you are reasonably competent in the language. If you are just learning German with the class you can still use the time to figure out together how German works and what the student thinks would work best for her/himself in terms of representing the language using ASL, DGS (German Sign Language), fingerspelling, or Cued Speech. Fingerspelling every word would definitely represent a foreign language exactly if it doesn't have a different alphabet, but it is just too much for most deaf people's eyes and the interpreter's hands. It is still necessary to fingerspell at least some words to introduce them, emphasize them, talk about spelling, and show affixes, declensions, and conjugations. Roman letters can be represented by fingerspelling, but some languages, such as Hebrew, Russian, or Greek, have different alphabets. Other languages, such as Chinese and Japanese, use ideograms to represent words which are not built up through a succession of letters that would guide in the pronunciation (although Japanese has three alphabets for some words and affixes). If the students and the interpreter learn the manual alphabet of a foreign language, it would save the interpreter from needing to transliterate2 the words. Some languages have additional letters through the addition of diacritical marks or other devices - such as French (ç, é, è, and o^), German (ä, ö, ü, and ß), and Spanish (á, é, í, ñ, ó, ú, and ü). One method that is used by the Deaf in Germany to represent umlauts (ä, ö, and ü) as well as the es-tsett (ß) is to move the fingerspelled letter downwards. An umlaut can also be represented by an "e" following the letter (such as "Tuer" for "Tür") but students will more often see the umlaut, so a visual equivalent is helpful. The best single resource for researching manual alphabets is by Simon Carmel, listed in the bibliography. French, German, and Spanish fingerspelling differs from ASL even in some letters that look the same in written form. I see no need to use the special French "F" for example. I found it interesting that "ch" and "sch" in German are looked upon as diphthongs in terms of fingerspelling and are represented by a single handshape, but it may be confusing to use these, since spelling C-H or S-C-H could serve just as well. Check with your consumer for their preference. There are also differences between the manual alphabet of the previously existent countries of East and West Germany. Just pick one that the interpreter and the students can agree on. Below is a German fingerspelling chart. Every language has a slightly different phonology or way to pronounce its letters. The interpreter needs to find out what the students want from their course. Do they want to learn how to pronounce, speechread, or only read and write the language? This is a good discussion to have with the teacher present, so that s/he can become aware of what modifications might need to be made. This will bring up the broader questions of how the deaf student should recite: using voice, fingerspelling everything, some sign and some fingerspelling, or cued speech. Cued Speech could come in very handy for representing a foreign language if the consumer knows it or wishes to learn it, since it represents the pronunciation (and the individual words) in a way that the eye can take in, rather than fingerspelling every word. Languages like French offer difficulty in so far as the pronunciation does not correspond to the spelling, but this is the same difficulty that hearing students have with such languages. As mentioned above, phonologies differ, so special cueing systems have been developed to represent phonemes that do not exist in English - French (j and r), German (ch, ö, r, and ü), and Spanish (á, é, í, j, l, ñ, ó, ú, ü, r, rr, and x). The bibliography mentions some articles on this aspect. Representing form or meaning is a choice that interpreters make daily as they decide what the goal of the communication is (such as the title of a book, a technical phrase, or a common saying) and what the communication mode of the consumer is (ASL or PSE) . All of us are familiar with the difficulty of representing English in ASL, and I personally agree with those that feel English should not be taught to the deaf through signing, but should be taught as a written language with explanations in ASL. This would probably work best for foreign languages also, but deaf people certainly have a right of access to foreign language classes, especially if this is the only way they can satisfy their degree requirements for a foreign language. There is a teaching method using computers which is generally referred to as CALL (Computer-Assisted Language Learning), although specific programs have been developed with their own names. If such programs are available at the school where the foreign language is being taught, the teacher may be able to give the deaf person guidance on how to use the computer programs to good effect, since they serve to promote reading and writing, rather than working through an auditory mode. See the bibliography for some articles on this methodology. An exciting development has been the blossoming of awareness about foreign sign languages. I look forward to the day that deaf people can get academic credit for learning these sign languages as well. It may be instructive to learn the bascis of a sign language for the country whose spoken language you are interpreting. There is a German Sign Language dictionary at "Das Vokabelheft" (Allgemeines Gebärdenlexikon) , and for other indigenous sign language dictionaries, see Indigenous Deaf cultures and sign languages of the world. Consult with the deaf person to see if they wish you to use foreign signs to represent some of the frequently occurring words in the foreign spoken language they are learning. They may wish the signed language of a specific country. For example, it they are learning German, they have the choice of North German, South German, Austrian, or Swiss Sign Languages. Some very basic words may be helpful to know how to sign in this language. When I interpreted for my introductory German class, I started with the German signs for "Guten Morgen (Good morning)", "Herr (Mr.)", "Frau (Mrs.)", "ja (yes)", and "nein (no)". Concepts in the language that have no English equivalent could be negotiated in this way, and as a matter of fact ASL is now incorporating such signs as SUSHI, SMORGASBORD, and VODKA. Some French, Spanish, and German Sign Language texts are cited in the bibliography. We've alluded to the difficulty of teaching English in ASL, and it's even more complicated for other spoken languages. Foreign countries, especially if they have a strong contingent that support oralism, may have an invented system (parallel to Manual Codes for English) to represent their spoken language, but this requires that the deaf person learn three languages: the written language, the signed language, and the manual code! Invented systems would not be beneficial anyway, for the same reason that MCEs only lead to confusion and are dropped by students and even teachers inadvertently due to their visual clumsiness. The method I used in my recent class was unvoiced Sim-Com, that is mouthing, in my case, German while simultaneously using conceptually accurate ASL signs and fingerspelling. The method you decide to use should be negotiated with your consumer. If there is no one-to-one match between English and ASL, which share some of the same culture, imagine trying to find one ASL sign for a given German word! This is where sign negotiation comes in. I never felt so needed as when I interpreted my German course. I dragged myself to work on days I would have otherwise stayed home because there were a limited number of German-speaking interpreters, it was an eight o-clock class, and no one but me knew what I had negotiated with the students. (1) Words that are being introduced for the first few times - "Wie heißt du?" ("What's you name?") = W-I-E H-E-I-ß-T YOU (or D-U)? Later when the focus is off "heißen" and that word has been learned, you could replace fingerspelling with a sign - "Meine Frau heißt Lisa" ("My wife's name is Lisa") could be represented as MY WIFE is-CALLED L-I-S-A. (2) German verbs are highly inflected so their conjugation should be reinforced through fingerspelling - "Ich liebe, Sie lieben, du liebst, er/sie/es liebt" ["I love, you (formal) love, you (informal) love, he/she/it loves"] = ME L-I-E-B-E, YOU L-I-E-B-E-N, YOU L-I-E-B-S-T, INDEX (or E-R, S-I-E, E-S) L-I-E-B-T. Note that YOU represents the honorific index, where the palm orientation is upwards and the hands sweeps downwards with the fingertips pointing to the person that is being referred to. Note: there are four singular and four plural forms for every verb in German. These correspond to the pronouns (1) ich, (2) du, (3) Sie, and (4) er/sie/es in the singular and (1) wir, (2) ihr, (3) Sie, and (4) sie in the plural. These could be referred back to quickly without repeatedly mentioning the pronouns by indexing them on the four fingers of the non-dominant hand for the singular and on the four fingers of the dominant hand for the plural. (3) Similarly with German nouns, pronouns, or articles in declension (such as "der, des, dem, den": the definite article "the", masculine, singular, in nominative, genitive, dative, and accusative cases) - "Sie wohnt in einem Studentenwohnheim" ("She lives in a dorm") = S-I-E LIVE IN E-I-N-E-M DORM. This assumes that the students have already learned the German word for "dorm" and that it is not necessary at present to focus on conjugation of the third person singular (wohnt). (4) Fingerspell and sign the substituted words in a substitution drill - "Welche Farbe hat das Buch? Welche Farbe hat das Papier? Welche Farbe hat die Wand? . . ." ("What color is the book? . . . the paper? . . . the wall? . . .) WHICH COLOR HAVE BOOK, D-A-S B-U-C-H? . . . PAPER, D-A-S P-A-P-I-E-R? . . . WALL, D-I-E W-A-N-D? . . .
(5) Fingerspell and sign words that are being used in an idiomatic way - "was machst du?" (literally "what do you make?") means "what's up? ", so I would sign WHAT'S-UP, W-A-S M-A-C-H-T-S D-U? (6) I fingerspell more of a given sentence to reinforce old ideas when I have extra time. A particularly good time for this is when the teacher says a sentence and the class is supposed to repeat it, or when students are slowly responding to a question from the teacher. I find that as the students get more advanced they can tolerate more fingerspelling in the foreign language and need it to break away from thinking in ASL or English but rather in the foreign language itself. German syntax differs from ASL (and English). Separable prefix verbs are a single word in uninflected form, such as "ausgehen" ("to go out"), but separate into two parts when inflected. For example, "Peter und Maria gehen am Donnerstag aus" ("Peter and Maria go out on Thursdays", literally, "Peter and Maria go on Thursday out.") I have not found a satisfactory way to represent such a syntactically different form. I end up explaining a great deal during these trying sentences: cultural mediation at its most frantic! For the previous sentence (while mouthing German) I would sign P-E-T-E-R AND M-A-R-I-A GO ON THURSDAY A-U-S, (aside) THAT MEAN EVERY-THURSDAY TWO-OF-THEM GO-TOGETHER. As I've mentioned before, spelling out everything seems to be an information overload, but each interpreter needs to negotiate with their students to see how much is too much. Some phrases behave like separable prefix verbs. For example, "ins Bett gehen" ("to go to bed') - "Er geht um 23 Uhr ins Bett" ("He goes to bed around 11 pm", literally "He goes around 11 pm into bed.") There is a sign GO-TO-BED, but to show the word order one might sign E-R GO THEREABOUTS 23 HOUR I-N-S B-E-T-T, (aside) THAT MEAN H-E TEND GO-TO-BED 11 P-M THEREABOUTS. Other common syntactic differences are dependent clauses - "Ich bleibe im Bett, wenn ich krank bin" ("I stay in bed, whenever I'm sick", literally, "I stay in bed, when(ever) I sick am"), and the perfect tense, when there are two parts to the verb - "Bertolt Brecht ist 1956 in Berlin gestorben" ("Bertolt Brecht died in Berlin in 1956"), where "ist" and "gestorben" together mean "died". The first sentence could be interpreted ME STAY IN BED, WHEN ME SICK B-I-N, (aside) THAT MEAN SUPPOSE ME SICK, ME TEND STAY BED, and the second sentence would need to be fingerspelled completely and then interpreted into ASL. As mentioned before, find out the goal(s) of the students in learning the foreign language: do they want to be able to speechread native speakers, write and read only, or also be able to pronounce the language? Remember to negotiate signs, how much fingerspelling is desired, and how will the students represent the "answer" to questions from the teacher - will they fingerspell the sentence, use voiced or unvoiced Sim-Com, Cued Speech, or some other option? It can be difficult for the interpreter to know when they are assuming that all the endings are correct or that they (the interpreter) are using cloze skills to fill in what the answer should be. If the students are not interested in speechreading or speaking the language, pronunciation drills will not be helpful in themselves, so perhaps the time could be used to merely spell out what the class is saying and interpret it, to give the students more exposure to the language. Another method that has been used where the interpreter works even more closely with the student is to use a laptop computer to "caption" the class. The interpreter types the drills and dialogue. The student and the interpreter can then practice the drills by typing on the laptop while the other students practice orally. At the end the session can be printed and saved for further study. A related method is to use a voice recognition system. The teacher wears a microphone and their speech is translated into text on a computer screen. One drawback is that the present state-of-the-art requires the person whose speech will be transcribed to spend many hours training the computer to become accustomed to their voice and will therefore require extra work from the teacher (as much as 15 hours). The system also can not transcribe spoken text from audiotapes or videotapes that might be used to supplement the hearing students' auditory training unless similar session are used to accustom the computer again. The computer will aso make some transcription mistakes that will have to be corrected later. Voice recognition programs dedicated to the language in question may be necessary to show diacritical marks. On the positive end, it will allow the interpreter to use their hands for interpreting so that they will not be flitting from keyboard to ASL or falling behind in the lecture and will lessen repetitive motion problems. It is always essential to be a team player with the teacher, and in foreign language classes it is inescapable. Show your interest in doing the readings and homework, so that the teacher will realize early on that the task of interpreting is more than a lexical skill like taking dictation. Some language classes use TPR (total physical response), where commands are given in the language, like "Springen Sie!" ("Jump up and down!"). For such situations it is especially important to interpret first and then fingerspell so that the time used for processing doesn't make the deaf students look slow. If students pair up for spoken dialogues delivered during a later class period as homework, the teacher might simply give the deaf students more written work as a substitute. If there is an auditory comprehension part to the tests, where the students listen to an audiotape and answer questions on what they heard, the teacher could have an additional written part for the deaf students' test. If there is group work and there is only one deaf student, ask the teacher if it is best to interpret for a hearing partner or if the interpreter should work with the student. Interpreting for a foreign language course presents a number of interesting challenges for interpreters, but by working with the teacher and students and preparing well for each class, it can be made to work. The teacher will have an opportunity to use creativity in redesigning some materials for the deaf students as well as to be exposed to yet another language (ASL) which may make them think more deeply about the relationship of language and culture. Interpreters will firm up their skills in the foreign language being taught and intercultural mediation. The deaf students will be able to gain access to a foreign language that will broaden their way of thinking about the world. A free copy from the publisher used for educational purposes, usually for an instructor. We use the word transliterate, not in the sense ASL interpreters are used to which is to represent English structure as much as possible with ASL, but in the older sense of a one-to-one system meant to represent words or sounds from one language (with a different source orthography) in the target orthography of one's native language. Image credit: From http://www.i-sphere.com/eyedeaf/captnez.htm (Captain Nesmuth) which is no longer extant. Image credit (German eagle and German Parliament): Deutscher Bundestag. Andersen, K. (n.d.) Teaching English as a 3rd language to deaf students. Beauvois, M. H. (1992). Computer-assisted classroom discussion in the foreign language classroom: Conversations in slow motion. Foreign Language Annals, 25 , 5, 455-463. Berg, C., Cavanillas, J., Coello, E., Dotter, F., Eisenwort, B., Hilzensauer, M., Holzinger, D., Krammer, K., Krozca, J., van der Kuyl, T., Montandon, L., Rank, C., Roukens, H., Schouwstra, F. and Skant, A. (1999) SMILE: A Sign language and multimedia based interactive language course for Deaf for the training of European written languages, in Preparation for the New Millenium - Directions, Developments, and Delivery: Proceedings of the 16th International Conference on Technology and Education. Grande Prairie: International Conferences on Technology and Education, pp. 188-190. Brentari, D. Foreign Vocabulary in Sign Languages: A Cross-Linguistic Investigation of word formation. This displays portions of the complete text. This book takes a close look at the ways that five sign languages borrow elements from the surrounding, dominant spoken language community where each is situated. It offers careful analyses of semantic, morphosyntactic, and phonological adaption of forms taken from a source language (in this case a spoken language) to a recipient signed language. In addition, the contributions contained in the volume examine the social attitudes and cultural values that play a role in this linguistic process. Since the cultural identity of Deaf communities is manifested most strongly in their sign languages, this topic is of interest for cultural and linguistic reasons. Linguists interested in phonology, morphology, word formation, bilingualism, and linguistic anthropology will find this an interesting set of cases of language contact. Interpreters and sign language teachers will also find a wealth of interesting facts about the sign languages of these diverse Deaf communities. Cabiedas, J. L. M. (1975). El lenguaje mimico. Madrid: Tall. gráficos de la Fed. Nac. de Soc. de Sordomudos de España. Carmel, S. (1982). 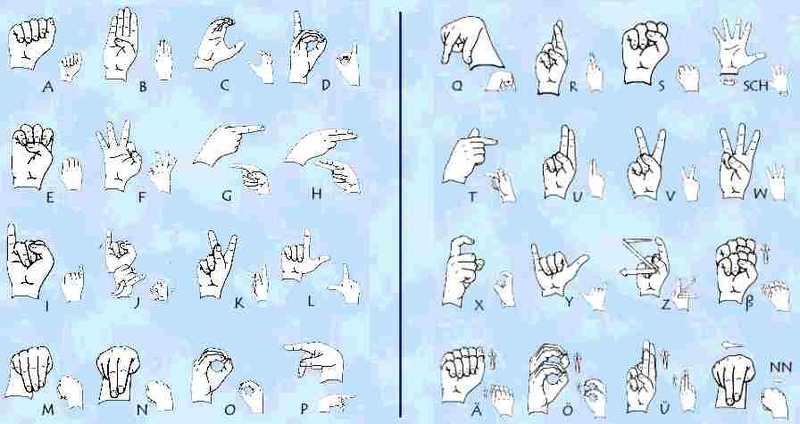 International hand alphabet charts. Published by the author. Clarke, M. (1993). Vocabulary learning with and without computers: Some thoughts on a way forward. CALL, 5, 3, 139-46. Kelm, O. (1992). The use of synchronous computer networks in second language instruction: a preliminary report. Foreign Language Annals, 25, 5, 441-454. Maisch, G. and Wisch, F-H. (1987). Gebärden-Lexicon . Hamburg: Verlag HörgeschädigteKinder. In 7 voumes: (1) Grundgebärden (Basic signs), (2) Mensch (People), (3) Natur (Nature), (4) Bildung (Education), (5) Gesellschaft (Society), (8) Technik (Engineering/Technology), (9) Haushalt und Freizeit (Household and leisure). Oleron, P. (1974). Elements de repertoire du langage gestuel des sourds-muets. Paris, France: Centre National de la Recerche Scientifique. Starcke, H. and Maisch, G. (1977). Die Gebärden der Gehörlosen. Hamburg, West Germany: Pergamos-Druck Heidrick & Bender. Tokuhama-Espinosa, T. (2003) Challenges to normal foreign language learning: dyslexia, Downs syndrome, deafness, in Tokuhama-Espinosa, T. (ed.) The multilingual mind: questions by, for and about people with many languages. Westport, CT: Praeger Publishers. Western Oregon University (2000) PEPNet Products Catalog (PDF). "Including Deaf and Hard-of-hearing Students in Foreign Language Classes" # 1077. Power Point Presentation with Speakers Notes. Targeting trainers, information is provided to instructors, students, interpreters and service providers to get beyond road blocks to including Deaf and Hard-of-hearing students in foreign language classes. Wunsch, R. (1993). Tuning up the language classroom: how the computer can make writing more effective. Die Neueren Sprachen, 92, 3, 228-249. For sites in German, see Deaf cultures and Sign Languages of the world: Austria (Oesterreich), Germany (Deutschland), and Switzerland (die Schweiz, Suisse). For sites in other languages, see Deaf cultures and Sign Languages of the world, and pick your country. LEO English-German dictionary. Over 170,000 entries. Richardson, T. Wie sagt man? CIA: The world factbook: Germany. F + U Academy for Professional Language Training: German. Lixl, A. German Internet trails. Vocabulix - Vocabulary trainer and conjugation trainer. You simply choose a lesson in a foreign language and the system will help you to memorize the words of that lesson. Conjugation trainer - With that powerful trainer you can exercise conjugations in various languages. Naturally, different times and forms are supported. If you have a username and if you are logged in, your input and your results will be memorized. You will be able to create your own lessons with the desired vocabulary, as well as measure your progress. German, Spanish and English are currently supported. Soon French and Hebrew. WESSWEB: German studies web. German-language newspapers and other news sources. Davis, C. D. (n.d.) Foreign language instruction: Tips for accommodating Hard-of-Hearing and Deaf students. WROCC Outreach Site at Western Oregon University. Foreign Language Resource Links. For German Sign Language (Deutsche Gebärdensprache), see: Das Vokabelheft (Allgemeines Gebärdenlexikon). Indigenous signs for cities: Austria. Indigenous signs for cities: Germany. Indigenous signs for cities: Switzerland. Linguistik-Lexikon. Not a dictionary, but a treatise on Sign Language structure. For other Sign Languages, see Deaf cultures and Sign Languages of the world and pick your country. iLoveLanguages - a comprehensive catalog of language-related Internet resources.